The fastest woman on the course of the twentieth jubilee Sportisimo Prague Half Marathon was Kenyan talent Joan Melly, who was clearly out to make a new world record from the very beginning. She missed out on that by a mere 13 seconds, however with the result of 1:05:04 she still managed to earn herself fifth place in the world half marathon tables. Reigning supreme among the men was Kenyan runner and RunCzech Racing Team member Benard Kimeli (59:47), with Jiří Homoláč coming out top among his Czech rivals, as predicted. Eva Vrabcová-Nývltová smashed the twenty-four year old Czech record. Thanks to the RunCzech Racing Team member the current national women’s record now stands at 1:11:01. “If you’d asked me before the race, I’d never have believed I was capable of such a result, it’s absolutely amazing,” the Czech record holder revealed as she crossed the finish line. The fastest woman on the course, Joan Melly, had cause for celebration with today’s result. The young Kenyan runner started very fast and even after the middle of the race the expected time was almost one minute better than the actual world record set in Valencia last October. In the second part of the race she started to slow down but despite that at the end she still managed to enhance her personal best and triumph in a time of 1:05:04, plus pick up the fifth best women’s half marathon time on record and third best result of this year. “The first five kilometres were exceptionally fast with us running it in under fifteen minutes, but I didn’t look at my watch at all, I just followed the pacemakers. I felt my strength wane a bit towards the end, but it was still enough to break a new personal best and secure a win. I’m incredibly happy I managed to do it in Prague and would like to thank everyone who helped me achieve this result,” the radiant winner shared at the finish. Running in second place over one minute later was compatriot Caroline Chepkoech Kipkirui (1:06:09) followed by Worknesh Degefa from Ethiopia in third place (1:08:10). The men’s race also delivered a gripping spectacle, leaving fans in suspense right until the final kilometre of the race’s twentieth event year. In the end victory went to Kenyan runner and RunCzech Racing Team disciple Benard Kimeli. “I won the ten kilometre Birell Prague Grand Prix last year, and now can add the half marathon to that. Prague really suits me and I race well here. The conditions went in our favour today and I’m really pleased that I managed to win,” Kimeli shared speaking of his triumph and personal best time of 59:47. The first three men across the finish all managed to do so in under one hour. Crossing the finish line in second place was Geoffrey Yegon (59:56) followed by Peter Kwemoi (59:58) in third place. The Czech women’s half marathon record held by Alena Peterková took place in Oslo back in 1994 – one year before the first ever Volkswagen Prague Marathon. 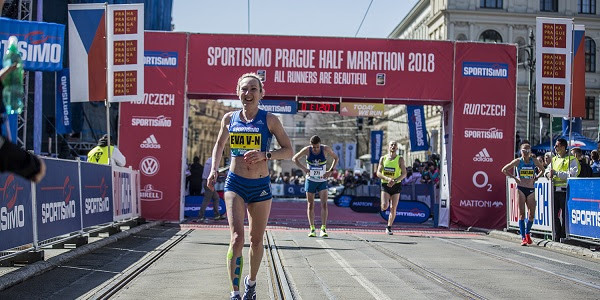 Eva Vrabcová-Nývltová, another RunCzech Racing Team member, came close to surpassing that target two years ago, however ended up finishing four seconds shy of a new record. But all good things go to those who wait and today was clearly Eva’s day in the limelight. The new Czech record (naturally also Eva’s personal best) now stands at 1:11:01. “After three doomed races, I’d started to tell myself my running career was coming to an end, but this is a huge boost to my motivation. Despite my husband and trainer Martin maintaining that I was capable of running such a time, I didn’t believe it and still can’t,” a smiling Eva Vrabcová-Nývltová revealed. Together with pacemaker Emmanuel Biwott, she had planned to finish in exactly 1:11. And the Kenyan pacemaker helped her do just that. “He was absolutely fantastic, he didn’t let me overdo it at the start, which secured a trouble-free first ten kilometres. I experienced a bit of a crisis in the second half but Emmanuel was there to help me pull through. It was a truly amazing experience working with him,” Vrabcová-Nývltová revealed in praise of his efforts. Running in second place was Kristýna Dvořáková with a significantly enhanced personal best of 1:16:55, followed by Czech veteran Petra Kamínková (1:18:35) in third place. In terms of the Czechs, Jiří Homoláč triumphed rather convincingly, though wasn’t especially pleased with his result of 1:04:33. “I had a cold last week and felt it come to the surface in the second half of the race. The first half was fine, but I came away from the group at the eleventh kilometre, was alone and it went downhill from there. But the conditions were really great,” Homoláč revealed at the finish. He was followed by Ondřej Fejfar (1:07:18), and Tomáš Edlman (1:09:26).